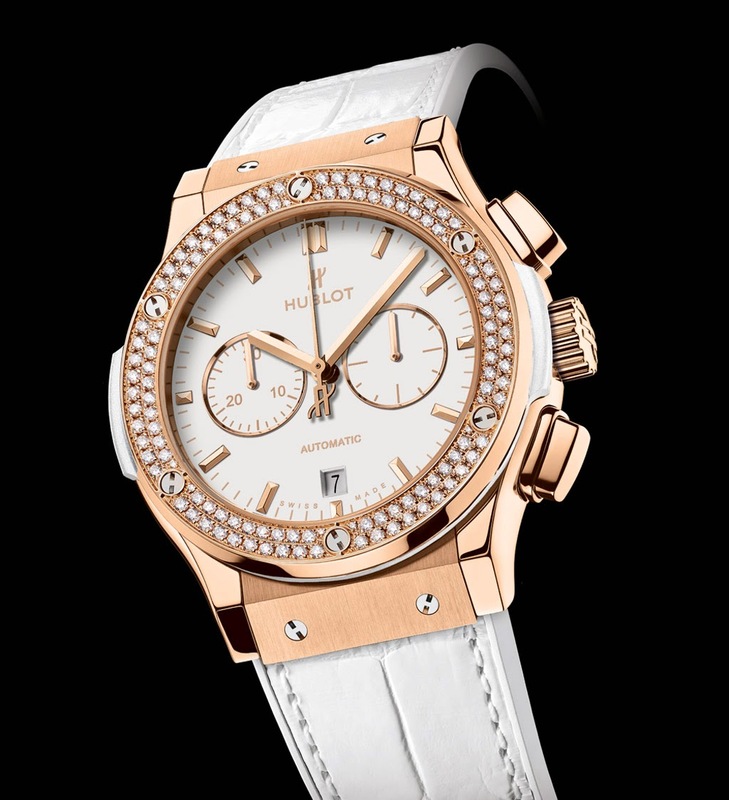 Hublot unveiled a new watch: the sporty Classic Fusion Chronograph White. 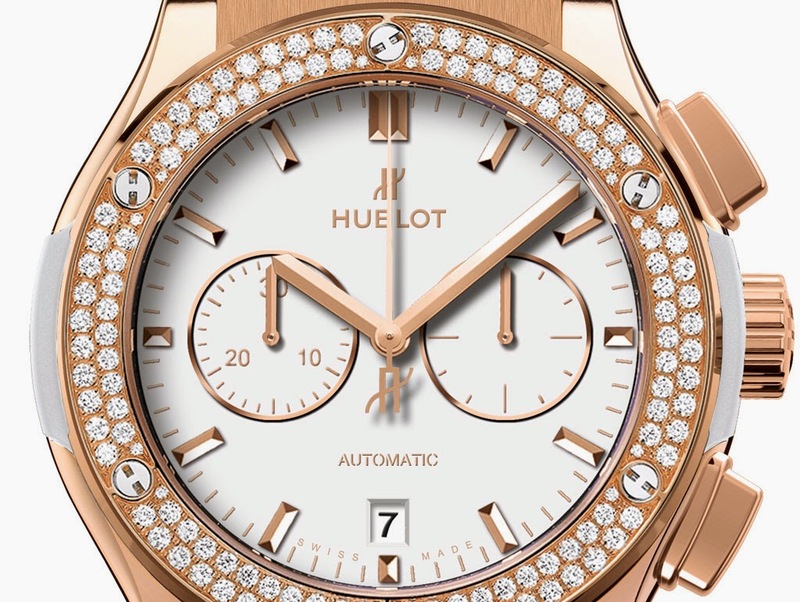 Although Hublot declared that it was designed for men and women, we see it as an eminently feminine timepiece, despite of a diameter of 42 mm, a size which is generally more suited for men. The new model will be available in two references: the King Gold Chronograph (ref. 541.OE.2080.LR.1104) and the Titanium White Chrono (ref. 541.NE.2010.LR.1104). The King Gold version is made of an extra-precious gold containing 5% of platinum. The bezels of both versions are characterised by six H-shaped screws in polished titanium. They are set with 42 white diamonds for a total of 1.35 carat. The Classic Fusion Chronograph White is equipped with the HUB1100 self-winding mechanical chronograph movement beating at 28,800 vibrations per hour and featuring a small seconds sub-dial at 3 o'clock, a 30-minute chronograph counter at 9 o'clock and a date display at 6 o’clock. The movement, visible through the transparent case back, offers a power reserve of 42 hours. The white alligator strap is sewn onto tone-on-tone rubber for better comfort and increased durability of the leather. 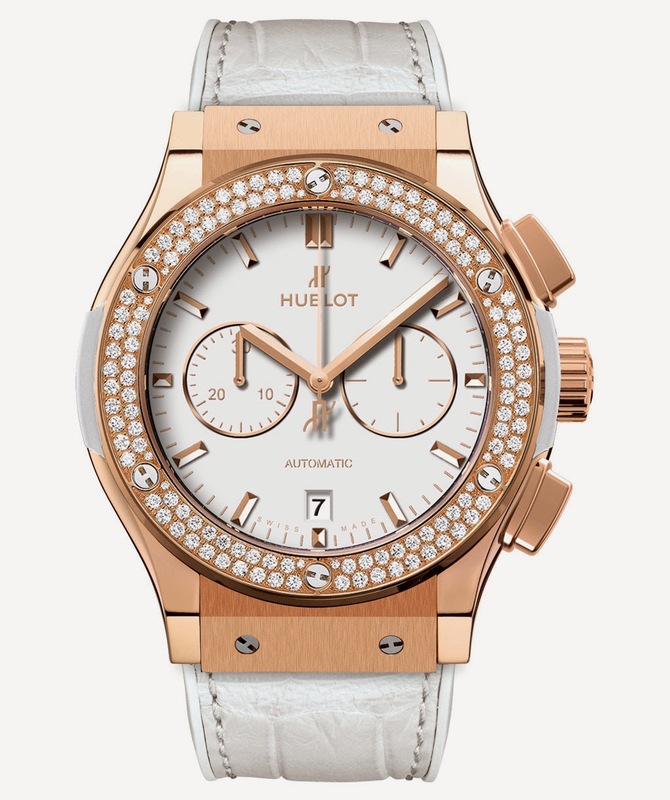 The Hublot Classic Fusion Chronograph White is water resistant to 50 metres. 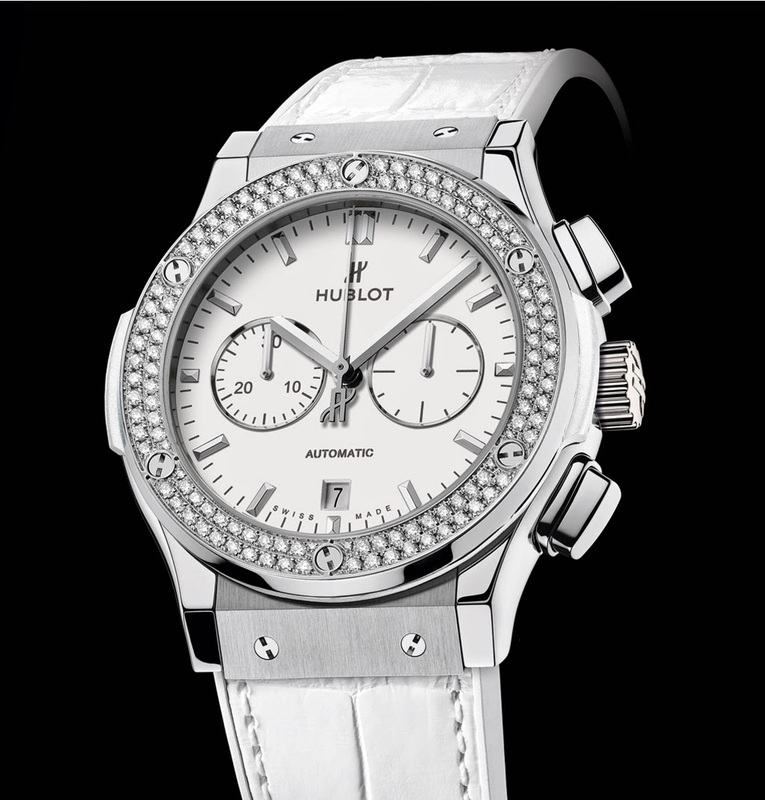 Hublot unveiled a new watch: the Classic Fusion Chronograph White. The new model will be available in two references: the King Gold Chronograph (ref. 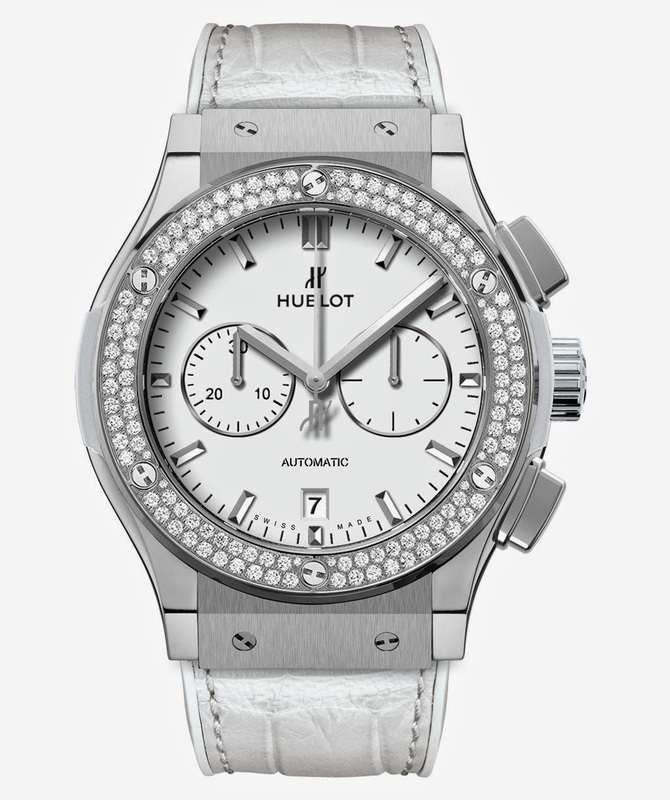 541.OE.2080.LR.1104) and the Titanium White Chrono (ref. 541.NE.2010.LR.1104).